We just completed the bulk of our fractions unit before break, although we'll still be doing some fractions review in the coming weeks! I've found that many kids have the misconception that one fourth is bigger than one half, because four is bigger than two. 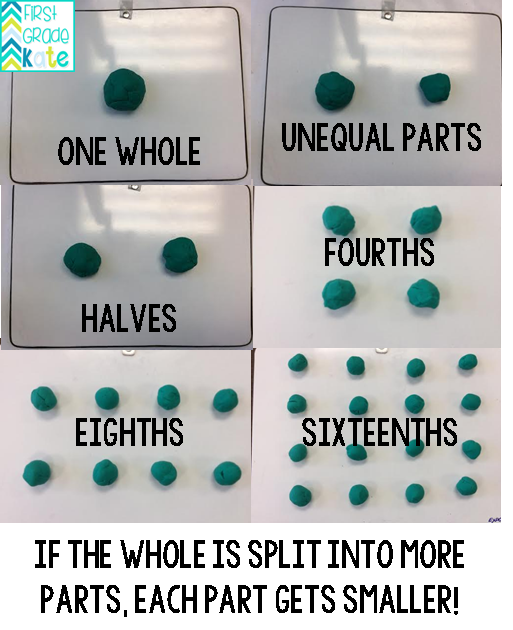 The 1st grade Common Core addresses this with 1.G.A.3, which says students will understand that "decomposing into more equal shares creates smaller shares". To try and model this concept, I did some illustrations on the board, and I gave many food examples about sharing brownies, cookies, etc. Some of my kids "got it" through that modeling, but I still had many who didn't understand. They knew that the object got more parts, but they couldn't tell me what happened to the SIZE of each part. One day, I was struggling to explain this concept when I spied a can of Playdough on my desk. (Because everyone has one of those on their desk right? No...just me?) ;) Even if you aren't weird like me and don't keep a can of Playdough on your desk, if you've been in a primary classroom, you know that Playdough is quite a hot commodity. In fact, I'm sure you've broken up many arguments involving "so and so getting more playdough". I started by pretending that I was the only one who wanted to play with the playdough, which meant that I would get the whole thing. 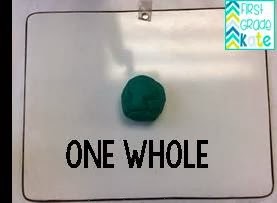 I had them tell me that it was "one whole". Next, I pretended that someone else came along and asked to play, which meant that I would have to share. 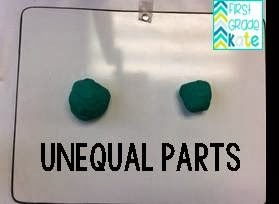 At first, I broke just a small part of the playdough off to give to the other person, and the kids erupted saying, "No! No! That's not fair!" I had them explain this to me further using the words "equal" and "unequal". 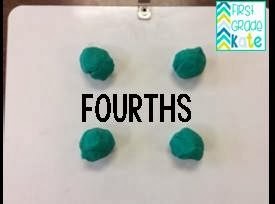 After the kids told me that my friend and I should split the Playdough equally, I had someone come up and split the Playdough into two equal groups. 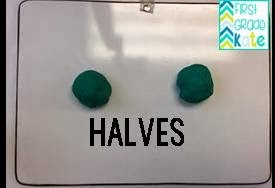 We then reviewed how two equal parts were called "halves" and figured out that if I got to play with one of the parts that my share was "1/2". By the time I got to sixteenths, the kids were freaking out about how little Playdough each person got. It was a great real-world example for them and really drove the point home that if you have to split something into more parts, each part (ie: how much THEY would get) would be smaller. 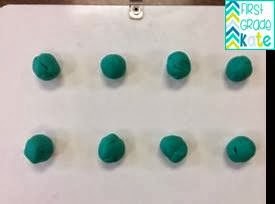 I encourage you to try this experiment with your class and see what kinds of connections they make with it! If you do try this, I'd love to know the results! Just leave a comment below or email me at firstgradekate@gmail.com. If you're a visual person like me and want to view this whole experiment in one fell swoop, feel free to pin the image below onto your Pinterest boards!